Both of my boys started school today. My oldest is in 3rd grade and my youngest is in preschool now. It was a sad day for me but I hope to fill the emptiness in my house soon with a bundle of joy… I still need to work on my hubby on that one. So in the meantime I will just keep on cooking! ha I wanted to make my boys something for breakfast for their first day. Something easy and something that I knew that they would love. My 3rd grader gobbled it down! I do have to say it was so delicious! And I loved how easy this was to put together! You can’t go wrong with Cinnamon french toast. It turned out awesome! Things that I would do differently next time: Half the recipe and make it in a 8×8. It would be perfect for the 4 of us. Will I make it again? Of course! Pour the melted butter into an ungreased 9×13 glass baking dish. Seperate both cans of refrigerated cinnamon rolls into 16 cinnamon buns, setting the icing aside. Then cut each cinnamon into 4 pieces and place the pieces on top of the butter in the baking dish. In a medium bowl beat the eggs. Then beat in the heavy whipping cream, cinnamon, and vanilla until they are well blended. Then gently pour over the cinnamon roll pieces. Sprinkle the top with the pecans and then drizzle with maple syrup. Bake for 20-28 minutes or until golden brown. Cool for 15 minutes. Microwave the icing on medium (50%) for 10-15 seconds or until it is thin enough to drizzle. Drizzle the icing over the top of the french toast bake. Serve with additional syrup if desired. Alyssa, this picture looks fantastic!! I want some of this right this very minute. my goodness this is sinful! Thanks for inviting me to visit your blog. I am so glad you did because this recipe looks awesome. I’m already putting the ingredients on my grocery list. I can’t wait to make them ! Hi Alyssa, I am so glad you stopped by my blog….I LOVE YOUR BLOG! I’m a new follower! I just pinned this recipe and off to check out more of your yummy shares! Have a great day! Oh WOW! That looks fabulous. Pretty sure I just gained some weight looking at it. Oh wow – I bet this was divine! 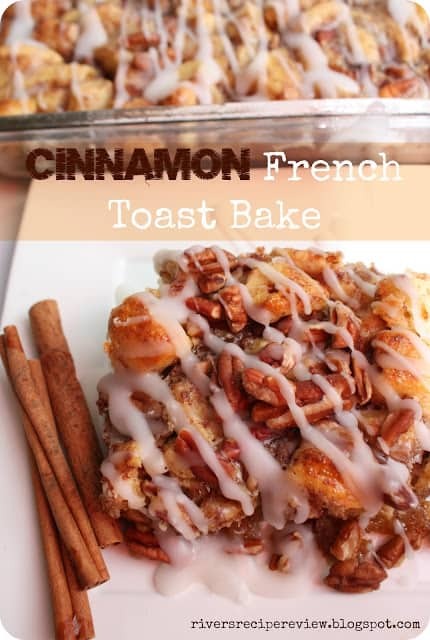 This is just the most delicious looking french toast bake ever! That picture has power over me and I must pin it! I bought all the ingredients to make this in the morning. I’m just doing the 8×8 pan the first time around. If it’s a hit then I’ll make the 9×13 pan the next time. I wouldn’t put that much butter on the bottom. The bottom came out too soggy. Maybe just spray the bottom of the pan with some butter flavored cooking spray. I made this a few weeks ago and forgot to comment. It was super good and reheated just fine. I think I ate it for breakfast for the next two days. Yum!! The baking time was way tooo short for mine! I had to almost double the time or it was just a hot gummy mess. But absolutely delicious once it was done! This was wonderful and so easy. Husband had thirds so it’s a keeper! This is my go to recipe for French Toast Bake. Some of the other recipes are too eggy. This one is perfect! We eat it every April and October when our church has an international broadcast, General Conference. Thanks for such an easy and delicious breakfast! Can this be made ahead of time? Like the day before and bake the next morning?